You hear so many horror stories about bad tenants, right? They trash the place, leave bills unpaid, harass the neighbourhood, and so on. 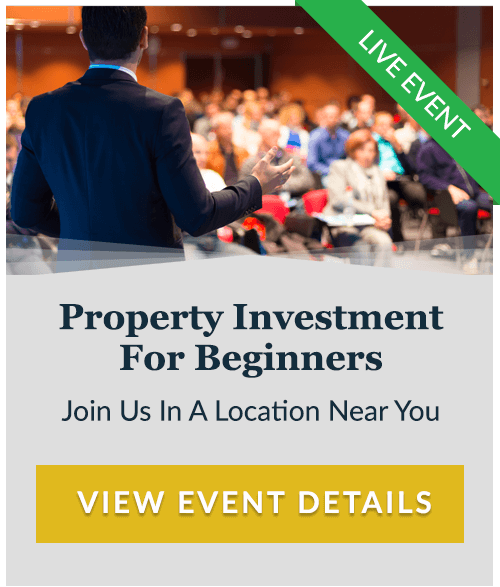 It’s almost enough to put you off property investing… If you don’t know how to avoid them. The good news is that you can pretty much totally avoid getting bad tenants ever again. And in the event that you DO get some despite all of your best efforts, a couple of extra measures will ensure you don’t lose out too much. So here are my top tips to avoiding getting sunk by bad tenants. 1. Buy in the Middle of the Market First of all, make sure you buy in the middle-of-the-market. That means avoiding lower-end, cheaper properties, as well as the higher end properties. The middle tends to be a safer bet if you want to avoid bad tenants. Here’s why… I can say this from experience, as I myself have come from a very low socio-economic area: bad people are usually poor people, but poor people are usually good people. It’s not whether you have money that makes you good or bad, but if you’re a bad person (and therefore a bad tenant), you don’t tend to have much money. Here’s how that works… bad people have a lack of respect for authority and for other people’s possessions. They are the types of people who don’t comply with leases and cause problems for landlords. These people are usually too poor to afford the middle of the market because these qualities are going to affect other aspects of their life, like their employment. You’ll also need to be careful that you don’t rent your property to multiple people. This is inviting bad tenants, because really, what you’ve got is the lower end of the market pooling their resources to live in the middle of the market. Ideally, you want a family, because they’re stable. They look after your property and are long-term renters because they don’t tend to make big moves or changes with children in the picture. So, if you buy houses in the middle of the market, and focus on getting families to rent them, you’re going to automatically disqualify most of the potential bad tenants. 2. Get a Great Rental Manager Once you’ve selected that property, it’s time to look for a great rental manager within that local area. So… what makes a great rental manager? Ideally, they own their own property so that they treat your property with respect and see things from your point of view as a fellow landlord. The radio of properties to rental managers within the company should be about 150. Any more than that might force them to cut corners (i.e. do fewer inspections). A rental manager with these qualities is going to be equipped to take proper care of your property. 3. Make Sure They Love You Even though you are paying your rental manager for a service, this isn’t enough to assume that they’re going to really take care of you. You see, they are the ones who have to do the work to get good tenants in, and your property is competing with others under management for their attention. 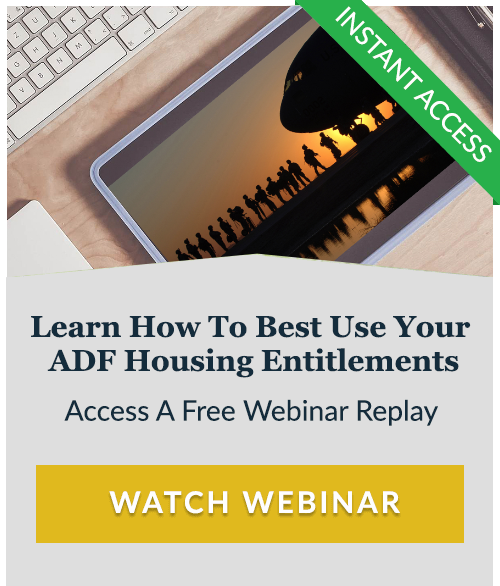 So, how do you make sure they put your property first and take really good care of you? 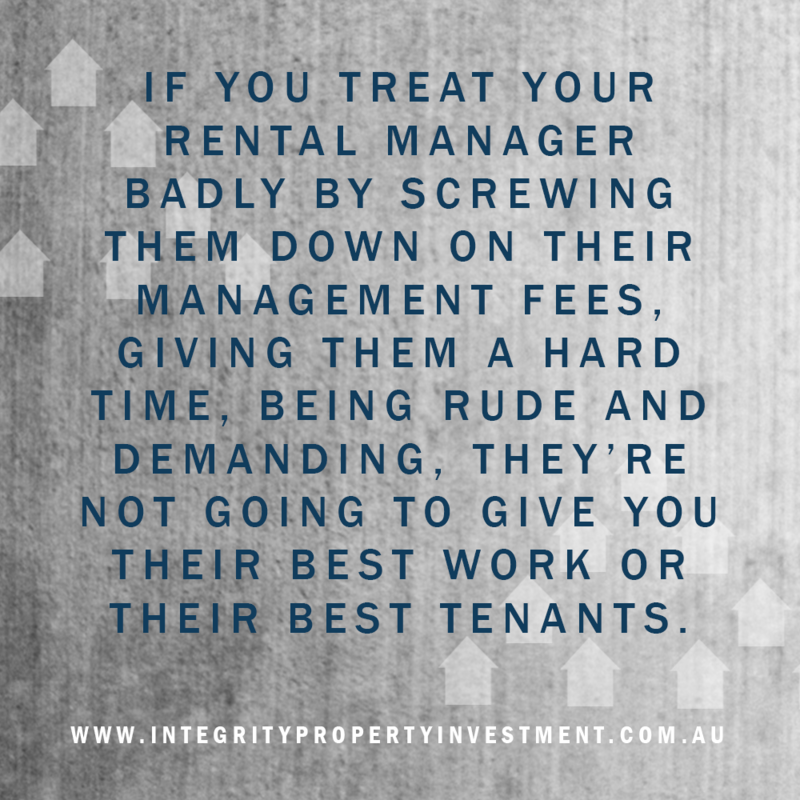 If you treat your rental manager badly by screwing them down on their management fees, giving them a hard time, being rude and demanding, they’re not going to give you their best work or their best tenants. And this will cost you money! 4. Have Cash Reserves and Landlord’s Insurance The previous measures have all been about prevention. This final step is about covering yourself in case a bad tenant still manages to slip through. This is your cure. First, you need to have cash reserves. This will cover you in the event of lost rent and damages caused by a bad tenant. Secondly, you need Landlord’s Insurance. This should cover most of the expenses associated with a bad tenant, but you still need the cash in reserve. This is because insurance may have excess and can often take some time to pay out. It is imperative that once you discover a bad tenant and any damage, you take action immediately. Evict them (legally, of course) and straight away, get tradies in and pay to fix anything necessary by using your cash reserves. Then you can get the property back up for rent and find a GOOD tenant as soon as possible. The shorter your period of vacancy, the less money you will lose. Don’t Let Fear Stop You As you can see, avoiding bad tenants comes down to sticking to a few simple rules. You can reduce your chances of a bad experience with your tenants to almost nothing by just buying in the middle of the market and hiring a good rental manager who loves you. 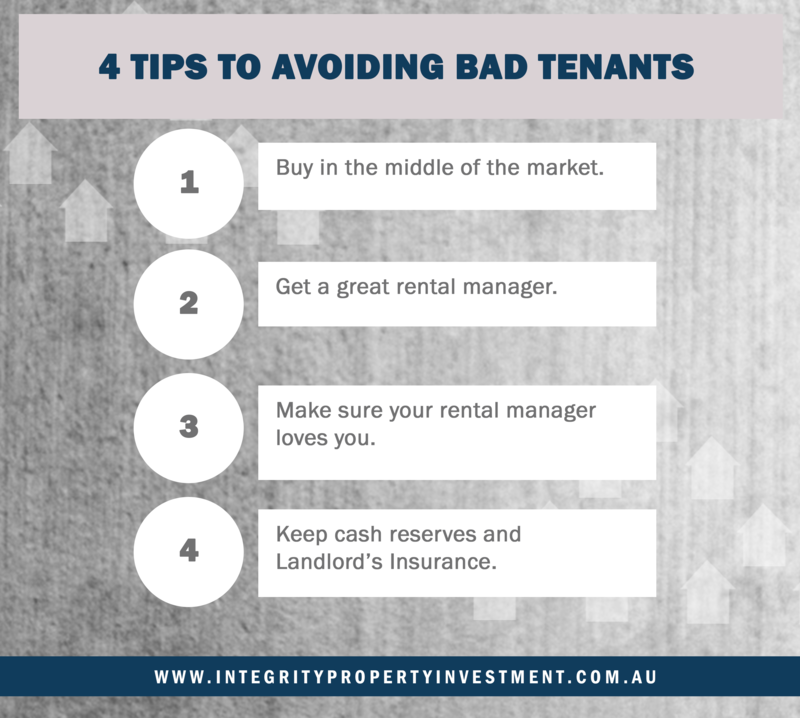 So, don’t let a fear of bad tenants stop you from investing in property, because if you don’t buy property, you’re guaranteed to make no money from property investing. 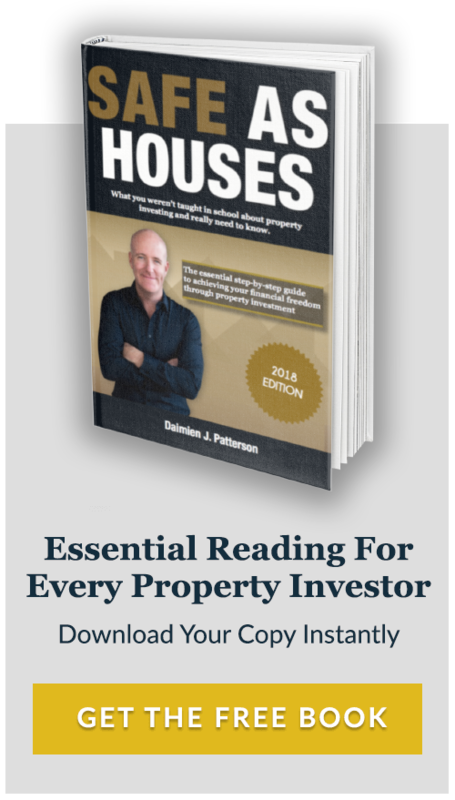 Happy property investing, Daimien Patterson is the CEO of Integrity Investment Properties, a property investment company based in Australia. 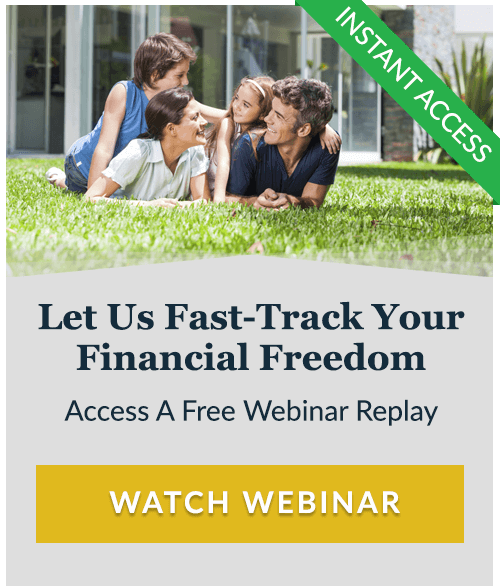 He regularly produces books, blogs, and videos on the topic of property investing. 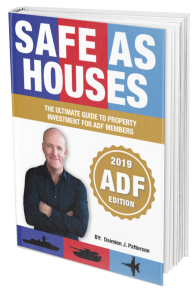 Head to [integrityinvestmentproperties.com.au] for your free copy of Daimien’s book, Safe as Houses.